Carleton Watkins’ “Lassen Peak” (1870) from the heart of the youthful and catastrophic lava domes of Chaos Crags. August, 2007. Watkins' picture courtesy the U.S.G.S, Denver, Colorado. Carleton Watkins visited Lassen Peak in 1870 with 28 year-old Clarence King as part of the government survey of the 40th parallel. 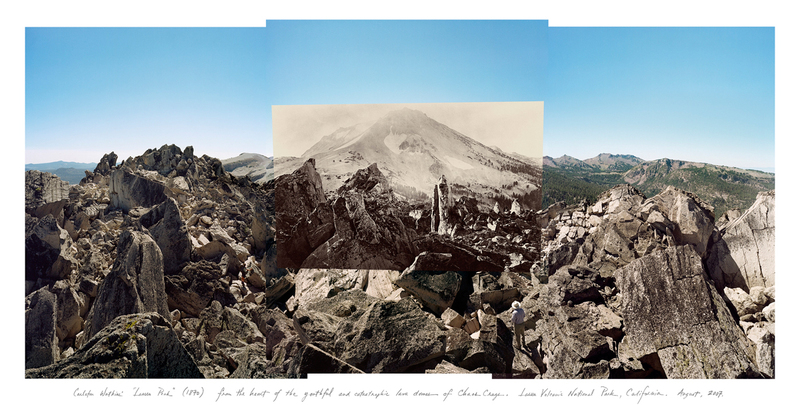 Watkins made his picture from Chaos Crags in what is now Lassen Volcanic National Park. The massive scale of the rocks in Chaos Crags is somewhat disorienting in both the picture and at the site. Some of the largest stones in the area are over fifty feet high. Note that there are two figures in the contemporary scene; one in the bottom center, and a second near the bottom left corner of the Watkins' picture. Left: Henry Weatherbee Henshaw, c. 1893. John Bidwell and party, pausing to rest beside the oaks. Right: April 8, 2007. Easter Sunday family outing in the Alligator Hole Parking Lot, Upper Bidwell Park, Chico, Ca. John Bidwell was one of the first emigrants on the California Trail and became a prominent figure in California history. He founded the town of Chico and had a substantial ranch and farming operation. The original picture (above left) shows John Bidwell while on a tour of his ranch. Bidwell's wife donated a substantial portion of the ranch to the city in 1905 to create Bidwell Park, one of the largest municipal parks in the country. The four oak trees that are visible in the original view are still present today, although the older two in the back have died and are slowly moldering. Left: Henry Weatherbee Henshaw, c. 1893. Cañon – Rancho Chico. From Annie Bidwell's personal album, titled in her own hand. Right: April 8, 2006. High water on Big Chico Creek. Near Salmon Hole, Upper Bidwell Park, Chico, Ca. This is a rephotograph of a late 19th century view of Chico Creek running through Salmon Hole in Upper Bidwell Park. I went back to this location about four times over five years in an attempt to get an updated version with the water level as high as in the first view. The rephotograph shown here was made after several weeks of relentless rain – and the water still isn't as high as in 1893! The original photograph was made by Henry Weatherbee Henshaw and was kept in Annie Bidwell's personal photo album.